Yesterday was the first day of fall (or autumn, if you must), and that means that summer is now officially over. Well, at least summer is over in the USA. Here in Costa Rica, the rainy season is starting to pick up in earnest. But that’s another story. 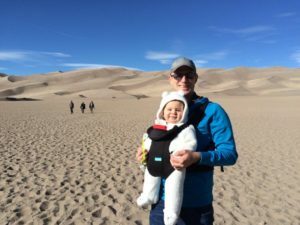 Whatever season you may find yourself in, today I want to share a family vacation idea that works especially well in the fall or even the winter: Great Sand Dunes National Park in Colorado. It’s also fun in summer, of course, but once the crowds subside and the temperatures lower in the fall, it’s an even better time to visit. 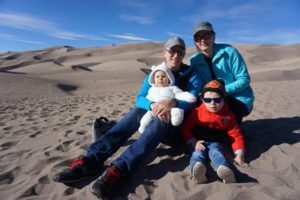 A family picture in December of 2017 at the Great Sand Dunes National Park in southern Colorado, USA. I’ve been to Great Sand Dunes National Park three times now. The first was when I was in high school. My friend Craig and I drove down to Raton, New Mexico, just to say that we’d been to New Mexico. Ah, being young is awesome, isn’t it? Anyhow, we stopped at the dunes on the way down, but at the time it wasn’t even a national park yet, just a national monument. I don’t remember much about that visit to the dunes, but I do remember that it was late spring or maybe even summer, and the sand was hot as hell. The second time I visited was in my first or second year of college. I went to meet up with my aunt, uncle, and cousins, who were camping there. The camping was great, but I think I didn’t even go on the dunes on that trip because on the second morning I went with my uncle to backpack and climb some fourteeners (another quintessentially Colorado pursuit that I’ll have to talk about in a future post). However, by far the best visit that I’ve had to Great Sand Dunes National Park was when we went this past December. We did a whole-family road trip from northern Colorado to Albuquerque, New Mexico, where my brother and his fiancee Laramie live. 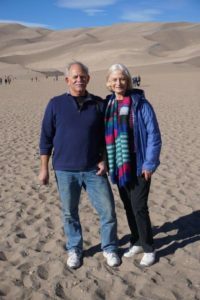 We stopped the first night in Alamosa and visited the sand dunes on the second day. Paul, my aforementioned brother, and Laramie, with their doggos. At first, I was a bit skeptical of the plan. After all, it was the dead of winter, and I thought it might just be a bunch of frozen sand. However, I was completely blown away by how beautiful everything was and how much we enjoyed ourselves as a family. That’s why I decided to share a few pictures and tips so that you can get some inspiration. Hopefully you’ll be able to make it there, whether in the fall, winter, or any other time of year! 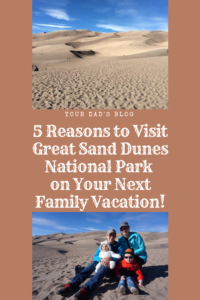 5 Reasons to Visit Great Sand Dunes National Park on Your Next Family Vacation! 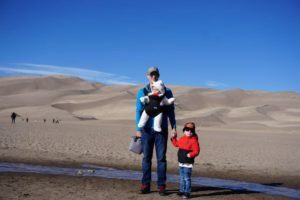 Why is Great Sand Dunes National Park a good vacation destination for families? There are several reasons, but here’s what we liked about it. The dunes, as seen from the road on our way out. I love love love how it looks like they put a piece of the desert right in the middle of the plains, with the mountains in the background! If you visit a national park in some random forest (not that there’s anything wrong with that, of course! ), then you’ll likely end up with some pictures of the Usual Suspects: trees, rivers, birds, and mountains. But if you go to the sand dunes, you’ll immediately know where you are. You’ll be hard-pressed to find such amazing landscapes outside of the Sahara. Seeing an ocean of sand with more-typical Colorado mountains in the background is truly a lovely sight. Sure, they just ran their hands through the sand for 10 minutes, as if they were hypnotized, but it was good, wholesome fun! 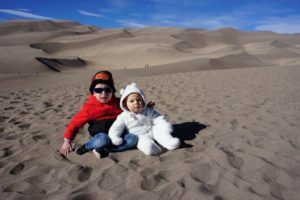 Kids of all ages can enjoy what Great Sand Dunes National Park has to offer. 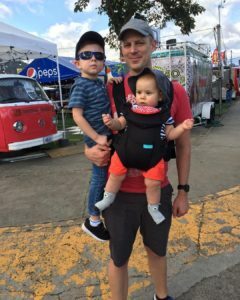 Our boys were under 1 and 3 years old when we went, and they both had a great time. Especially since they’ve grown up in Costa Rica, where you won’t find many sandboxes except for the beaches, they both really dug the sand (pun intended). You’ll probably need to help younger kids climb the dunes, if you choose to do so. We stayed fairly close to Medano Creek, the small river that you cross at the first entrance to the dunes (another place where you’ll likely need to give them a hand), but we didn’t feel like we were missing anything by not going far into the dune sea by climbing the ones on the horizon. Young kids may also be participating in the “Junior Ranger” program that the National Parks promote. My folks on the dunes. If you have teenagers in the family, they might also be interested in going “sandboarding.” After an ill-fated morning of snowboarding about 15 years ago, I decided that I wasn’t made for single-board sports, but if that’s your thing, then more power to you. Finally, because it’s a national park, there’s also a visitor center. We sat outside and enjoyed the view of the dunes while we enjoyed a lunch we brought along. We also spent a bit of time inside the visitor center looking at the exhibits and gift shop. The exhibits have a few things that might interest kids, and there’s also a family seating area inside. It also gave us a chance to warm up once temperatures got cooler later in the afternoon. 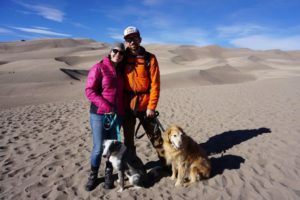 As a quick aside and addition, after I initially published this post, Paul and Laramie also mentioned how winter was probably the perfect time to bring their dogs to the dunes. Dog paws are sensitive and the hot sand in the summer can easily burn them. But in the winter, they were comfortable and didn’t have any issues with walking on the sand. So that’s another reason to bring your “kids” along, even if your kids have four paws. Medano Creek. You need to cross it to get to the dunes, so it’s a good idea to bring waterproof shoes and a towel. Never forget to bring a towel. If you look at pictures that people take when they visit the sand dunes, they of course tend to prominently feature the sand dunes. And the dunes are beautiful, as we’ve already seen, but there are plenty of other sights and activities that you can explore and do in the park. There’s even an entire area of the park, the National Preserve, that we haven’t gotten a chance to check out. That’s to the east of the dunes and features more traditional mountain landscapes and activities. You can also stick to the dunes and have more than enough to keep you busy for a whole day. The park’s visitor guide even includes suggested activities that you can do if you have different amounts of time. Aside from the obvious activity of roaming the dunes, you can also go for a swim in the creek at the base of the dunes. Of course, that’s only a good idea if it’s summer; when we were there in the winter, the creek was covered with a thin layer of ice that we had to walk on carefully in order to cross it. Hold on tight to your kids, especially if they’re a bit klutzy. Additionally, there are great options for camping, hiking, and backpacking, or you can go sandboarding or participate in the Junior Ranger program, as I mentioned before. Depending on when you go, it might also be cool to take advantage of the park’s nighttime activities. And there’s always my personal favorite pastime, photography. When I visited the first time in around 1997 or so, digital cameras were still about a half-decade down the pipeline, and I’m pretty sure I didn’t take a single picture. Same with my second trip in 2001 or so, when I went camping with my cousins. So on this past trip I took around 200 pictures in one day to make up for my previous trips. A view from the road going north into the national park. For more ideas, check out the official visitor guide for the park. It’s published by the National Parks Service and while it’s only a couple pages, it’s a great place to start planning your visit. Sure, the sand dunes are a bit of a drive from major cities, but that’s pretty typical for most national parks. But it’s also not like you’ll be driving for half a day just to get there. You can make the drive from most parts of the Colorado Front Range, Denver included, within a few hours. It’s also about 3 hours from Santa Fe, New Mexico, and about 4 hours from Albuquerque. 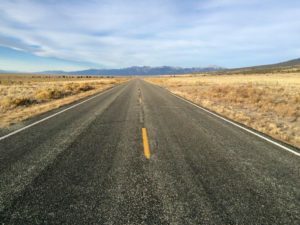 For an even closer option, the city of Alamosa is about an hour away, which gives you a place to stay before or after you visit. Alamosa is a high desert town that I’d never been to until this past trip, and I thought it was pretty cool. I wish we had had more time to explore the area but I guess it gives us another excuse to go back someday! Finally, the dunes are in southern Colorado, in a comparatively less-visited area of the state. If you head in any direction, you’ll be able to visit other forests, mountain ranges, and national parks. And if you go south into New Mexico, you can combine the dunes with trips to Taos, Santa Fe, or Albuquerque. Me and my Desert Polar Bear Baby. Despite the cool temperatures, the sun kept us warm and toasty! As I mentioned before, I was a bit concerned about visiting the dunes in the winter. I’m not one to shy away from cold temperatures, but let’s just say that my tropics-born wife and kids are perhaps less inclined to enjoy sub-freezing temperatures. When we got to the sand dunes, though, the weather was absolutely gorgeous. It was one of those Colorado winter days when the cloudless sky is deep blue, and even though the temperatures may be close to freezing, it’s still not that bad to be outside because it’s so sunny. Now, I don’t know if we had typical weather for the end of December, but it didn’t seem that odd. What did seem odd, though, was getting pictures of us in our winter jackets, surrounded by a sea of sand. But it was odd in a cool way. Medano Creek later in the day, when the layer of ice on top was beginning to thaw. Be careful! It’s thin, slippery, and very cold if you fall in! Plus, the cooler temperatures made the sand much more comfortable. I honestly can’t imagine wandering around a lot on the sand in the summer because it gets unbearably hot. When we were there, it was actually nice and cool, and the boys had lots of fun playing in it. A panoramic view shows that although we weren’t alone, we certainly didn’t feel like anyone was crowding us. What’s more, I imagine that the crowds are significantly smaller in the winter. There were some people, of course, as you can see in my pictures. But it wasn’t like the crowds that you have to wade through during the summer at some other national parks in the western United States. Having said all that, though, you should definitely check the weather before going and use lots and lots of common sense. If you go in the winter, you need to realize that it’s still Colorado. Even though it may look like a hot desert, it can still quickly drop well below freezing and dump a bunch of snow on you. Also remember that Colorado is generally very dry, and Sand Dunes is no exception. Take lots of water and bring your sunscreen—yes, even if there’s snow, because snow can reflect and cause some of the worst sunburns! Finally, don’t forget that the whole area is at a very high altitude. Its lowest points are around 8,200 feet (almost 2,500 meters), and the highest areas get up to over 13,000 feet (4,100 meters). It’s much more difficult to do any physical activity at altitude, and you need to be sure to drink plenty of water to avoid headaches and getting altitude sickness. Oh, and my car even got vapor locked when I drove up to the park on my second trip. It was weird, and just like the episode of The Simpsons with Joe Namath—well, except that Joe Namath wasn’t there. Anyhow, I’m not saying all of that to scare you, but I want you to have all the knowledge necessary to have a great, fun, and safe trip! Feel free to pin or share this or any of the other images in this post, if that’s the kind of thing you do. Great Sand Dunes National Park is a wonderful, unique experience for the whole family. It’s on many a bucket list (even though I think that term is kinda stupid), and it’s a place that you should absolutely visit if you’re ever able to. If you’ve visited the sand dunes and have any tips, resources, or memories that you’d like to share, please let me know in the comments below.